Quesillo is a popular and delicious appetizer on the islands of Curacao, Aruba, and Bonaire. Quesillo (Spanish pronunciation: [keˈsiʎo], meaning "little cheese") refers to different Latin American and Spanish foods or dishes depending on the country. On the island of Curacao, Aruba, and Bonaire, we have different variation in flavor. This one of the version of the quesillo. Enjoy! For the Caramel , sprinkle the sugar in a rond cake pan, and put it on the stove on medium high. As the sugar start melting, use a Pot Holder to pick up the pan and let the sugar melt into a caramel evenly on the bottom of the pan. Make sure that all sugar is melted into a caramel. Golden brown color. Put the pan back on the heat if it starts to cool of and not at desired color. After 90 minutes, use a sate stick or eating knife and poke in the middle to see if quesillo is fully baked. If you see wet sticky mixture on the knife or stick, let it back for another 15 minutes untill knife or stick comes out clean. 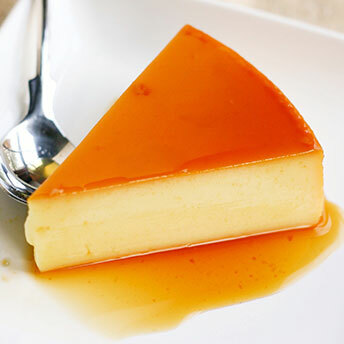 When quesillo is cold, loose the quesillo from the pan by passing a knife on the edge of the pan. In a not so deep tray, flip the quesillo over on to the tray. Keep in mind, the caramel will become a sause not. So tray needs to be deep enough to hold this sauce. Quesillo is ready to serve.